Would Kavanaugh limit the Chevron doctrine? Unlike Justice Neil Gorsuch, Supreme Court nominee Brett Kavanaugh hasn't called the Chevron doctrine entirely into question or questioned whether the law world would be better without it. But he could side with other conservatives on the court in limiting its application. According to Chevron, courts defer to reasonable agency interpretations when Congress has been silent or ambiguous on a topic. It's a key doctrine in administrative law and one that's often invoked in environmental cases. From his 12-year record on the U.S. Court of Appeals for the District of Columbia Circuit and a review of his speeches and law articles over the last several years, Kavanaugh appears mostly concerned with the first step of the Chevron test — discerning whether a statute is ambiguous. He has also embraced a Supreme Court doctrine that calls for not applying Chevron to major agency rules. "I would expect him to approach Chevron the way the chief justice does, which is to try and cabin its scope, so that agencies get deference in a smaller category of cases, and only when there is no doubt Congress expressly intended to leave the matter to the agency's discretion," said Jody Freeman, a law professor at Harvard Law School and a former climate adviser to President Obama. The Chevron doctrine, which is named for a 1984 Supreme Court case, played a big role in the confirmation battle for Gorsuch, who wrote a scathing concurring opinion slamming the doctrine shortly before he was nominated for the high court. Senators focused several questions on the doctrine during Gorsuch's multiday hearing. While Chevron is unlikely to make front-page news during the Kavanaugh confirmation process, the debate over the future of the doctrine remains strong, particularly in conservative legal circles. During his short time on the court, Gorsuch has written a handful of statements calling for limiting the doctrine. Shortly before announcing his retirement in late June, Justice Anthony Kennedy, long the moderate of the court, expressed his own doubts (Greenwire, June 21). Kavanaugh, who formerly clerked for Kennedy, would likely be similar to the retiring justice but "maybe a bit more muscular in language in limiting Chevron," said Kent Barnett, a law professor at the University of Georgia who has studied the doctrine's application in the courts. "The direction the court is likely to go is not overrule Chevron, but be really, really careful about where Congress would want Chevron to apply," Barnett said. In his time in the D.C. Circuit, Kavanaugh often found that agencies don't have the authority to issue regulations under the law, particularly in the context of the Clean Air Act. 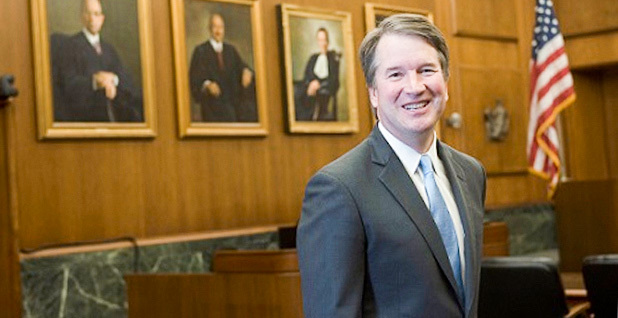 Kavanaugh wrote opinions and dissents rebuffing several of the Obama administration's emissions regulations (E&E Daily, July 10). "Judge Kavanaugh's record suggests that he has no hesitation deciding when agencies are out of bounds and don't deserve deference," Freeman said. When it comes to Chevron, Kavanaugh believes that it's a problem that there's no "definitive guide" for determining whether a law is ambiguous. "Many judges do this, but sometimes he avoids reaching any Chevron question because he finds that the law is clear," said Lisa Heinzerling, a professor at Georgetown Law and a former Obama EPA official. "He has a pretty pronounced tendency to find the law clear in cases where he's rejecting what the agency did." Kavanaugh laid out his concerns in a 2017 speech at the University of Notre Dame. "How do courts know when a statute is clear or ambiguous?" he asked. "Quite simply, there is no good or predictable way for judges to do this," he said. "Judges go back and forth. One judge will say it is clear. Another judge will say, 'No, it's ambiguous.' Neither judge can convince the other. Why not? The answer is that there is no right answer." The issue has significant practical consequences, namely that "different judges will reach different results," he said in a separate 2016 speech at George Mason University. On the D.C. Circuit, Kavanaugh has also taken to heart the Supreme Court's so-called major questions doctrine, which states that Chevron should not be applied to rules that are economically, politically or socially significant. Notably, the late Justice Antonin Scalia invoked that doctrine in the Supreme Court's 2014 decision throwing out portions of a rule requiring stationary facilities to obtain air permits for emissions of greenhouse gases. During marathon September 2016 arguments over the Clean Power Plan, the Obama administration's rule for cutting carbon dioxide from existing power plants, Kavanaugh focused several questions on whether the rule was transformative enough to warrant the special standard of review. He said then that "Congress should be making the big policy decisions" or clearly delegate them to federal agencies in laws. Harvard's Freeman said that view "leaves less room for agencies to adapt old laws to new public health and environmental challenges by interpreting their statutes flexibly." Kavanaugh refined his views on the doctrine in a 2017 dissent to the D.C. Circuit ruling that upheld the Obama administration's net neutrality rule, which he called "one of the most consequential regulations ever issued by an executive or independent agency in the history of the United States." He wrote that the Supreme Court had required "clear congressional authorization" for major agency rules. "The major rules doctrine helps preserve the separation of powers and operates as a vital check on expansive and aggressive assertions of executive authority," Kavanaugh wrote. "He's come down pretty firmly on the side of saying an agency can't issue a major rule without clear congressional authorization," Heinzerling said. "It would be a big deal if that rule had gotten embraced." According to new research exploring the doctrine's political dynamics, Kavanaugh is "pretty neutral" about how he applies Chevron, Barnett said. In a forthcoming article in the Vanderbilt Law Review, Barnett and other law professors found that Kavanaugh generally applies the doctrine the same way regardless of whether the outcome could be deemed liberal versus conservative. "He's pretty close to the middle," Barnett said. "He's consistent in applying Chevron." Dan Farber, a law professor at the University of California, Berkeley, noted that while Kavanaugh has "rarely been on the environmental side of a case," he goes "out of his way to express appreciation for the goals EPA is trying to pursue." For example, in his majority opinion striking down the Obama administration's effort to phase out hydrofluourocarbons, which are potent greenhouse gases, Kavanaugh wrote that the court respected the effort to order the replacement of substances found to contribute to climate change in the absence of congressional action on the issue. But, he wrote, "however much we might sympathize or agree with EPA's policy objectives, EPA may act only within the boundaries of its statutory authority. Here, EPA exceeded that authority." Farber said: "He does seem to understand that agencies have a fair amount of discretion within what he thinks are statutory bounds." At a 2017 lecture at the conservative Heritage Foundation, Kavanaugh dismissed the idea that the debate over statutory interpretation is "all politics" and "inherently complex." "In my view, it is a mistake to think that this current mess in statutory interpretation is somehow the natural and unalterable order of things," he said. "Put simply, we can do better in the realm of statutory interpretation. And for the sake of the neutral and impartial rule of law, we must do better."